The 2014 UTeach conference at the University of Texas Ausin brought together faculty, students and staff from 40 universities with UTeach programs and five universities aspiring to build a UTeach program. The UMass Lowell UTeach team included two UML math majors, Erinn McLaughlin and John Romano. 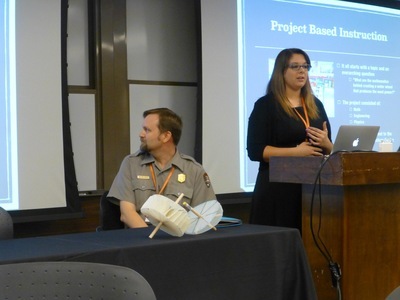 ErinnMcLaughlin, togetherwithMichelle Scribner-MacLean(Graduate College of Education) and William Morton (Lowell NationalHistoricalPark), described how she and her classmates teamed with the National Park to create science and math projects for high school students. The work was part of the requiredUTeachcourse, Project Based Instruction. 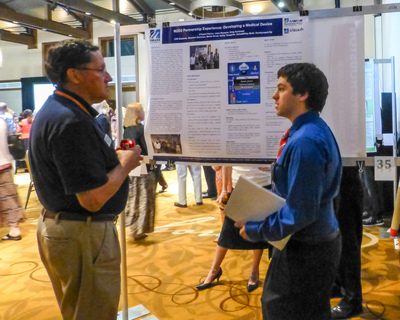 At a poster session that included dozens of student submissions, John Romano won the best student poster for a research project for the work he did as an intern with M2D2 and Lowell High School. Erinn also displayed a poster on the mathematics of water wheels.